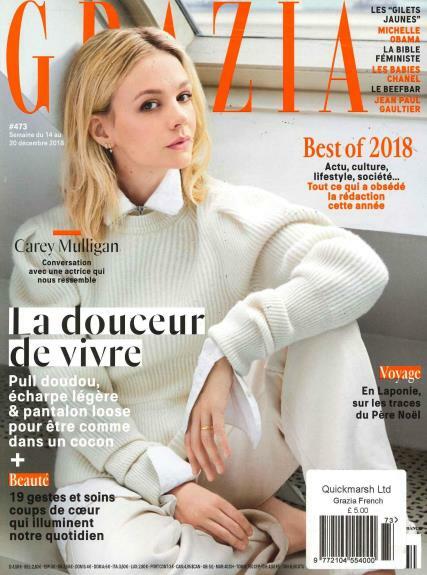 The French language edition of the famous weekly glossy fashion and celebrity mag that women enjoy world over, Grazia French really needs no introduction but we’ll give it one anyway. Buy a single copy or subscription to Grazia French magazine. The French counterpart of the famous weekly glossy fashion and celebrity mag that women enjoy world over, Grazia French really needs no introduction. Grazia French offers a look at the glamorous world of celebrity culture, featuring reviews, articles and interviews starring some famous names and including both French and international celebrities. This great magazone also contains the very latest in fashion and beauty products and therapies and where to find them, as well as lifestyle features such as movie reviews, food, horoscopes and advice on love and relationships. Perfect for the internationally minded fashion forward stylish woman.